The Rialto Design Residence is located in the beautiful setting of Rio Terà San Leonardo, a typical Venetian area, in the historical city center, full of shops, trendy bars, art galleries and renowned restaurants. This building, built in 1518, was recently restored by Gianluca Bartholomeo, a designer of international fame, who was able to renew the beauties of the past in a contemporary way. His meticulous work brought a new light to the property while retaining the soul of the past such as the original beams. Today the property boasts designer finishes and furnishings as well as all modern comforts. The restoration has led to the development of 5 beautiful apartments of various type and size named Design 1, 2, 3, 4 and 5. All apartments are equipped with heating, air conditioning, free WiFi throughout the property as well as dishwasher, washing machine microwave and more other. The apartment Design 3 boasts a balcony overlooking the courtyard. It is fully furnished with designer furniture, modern paintings, sophisticated lighting, large and bright windows. The apartment is located on the first floor of the residence. It consists of a living room with a sofa bed and a fully equipped kitchen complete with stove, refrigerator, microwave, dishwasher, toaster and utensils. There is a large and bright bedroom with a double bed, a single bed-puff and a spacious wardrobe. The apartment is equipped with a storage room and a large bathroom with shower, toilet, bidet and washing machine. The rental rate includes some comforts such as free Wifi, air conditioning and heating, TV 32 inches, hairdryer and a cot for infant (on request) as well as the final cleaning and the first supply of bed linen and towels for each guest. 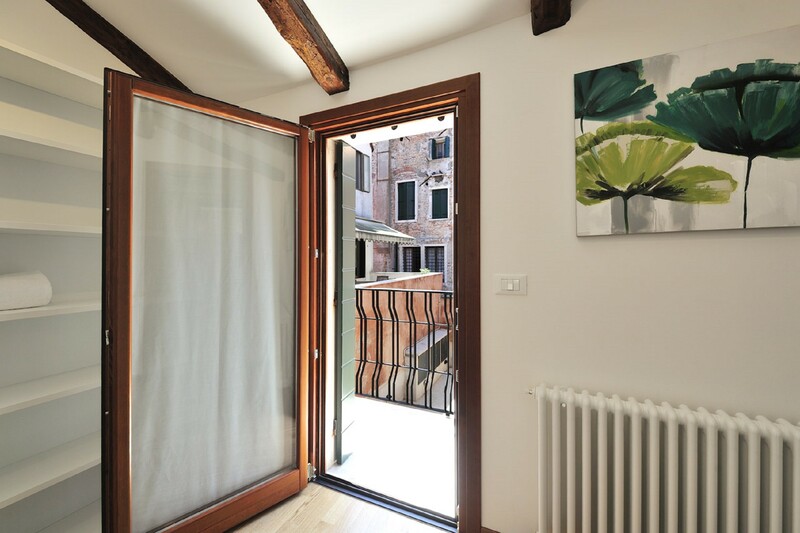 Rialto Design Residence welcomes you in Cannaregio, one of the most lively areas of Venice with many typical restaurants where you can enjoy an authentic Venetian atmosphere. The proximity to the train station and Piazzale Roma makes the residence a very convenient solution for your holidays. In a few minutes you can reach not only some strategic points such as the train station or the cars terminal, but also churches, interesting monuments and historical places. Art and culture are everywhere. The residence is located in Rio Terra San Leonardo just in the heart of the New Road, a short walking distance from the Jewish Ghetto, the Rialto Bridge and Piazza San Marco. In that area, you can enjoy a wide range of restaurants of various ethnicities and then end your evening at the famous and charming Venice Casino, located in the beautiful Palazzo Vendramin Calergi overlooking the Grand Canal. Recommended vaporetto stop is: Guglie. 1 King size bed, 1 Sofa bed double, 1 Sofa bed. 1 TV, TV Satellite (Languages: Spanish, English, German, French), 1st floor, iron, internet (Wi-Fi), hair dryer, balcony, 50 m² property, single boiler on gas, air conditioning in the living room and in some bedrooms, 1 electric anti-mosquito device.